Eid Mubarak everybody! I hope your Eid is fun and spent with people you love. It's a little early but we're leaving in the morning for Luxor, inshaAllah. I could just schedule the post but I couldn't wait to wish everyone a joyous holiday. Here's a little info on Eid and what it is, for non-Muslims. To be honest, the best part of going away for Eid ul Adha for me is skipping the whole meat thing. I don't want to cook on a holiday and I'm not a fan of sheep or lamb meat. I hope that doesn't make me a bad Muslim. Happy Eid! Enjoy your holiday in Luxor! So jealous I wish we were going away but we're stuck in Cairo for the holiday.However most people will be traveling so Cairo should be a bit quiet Insha'allah! P.S I am not a big fan of lamb either and I nearly passed out the couple of times I went to see the sacrifice. A'salaamu alaikum sis. I don't like lamb either; it's a big joke with my in-laws, the American beef-eater. ;-) I didn't grow up eating it and I just can't train my tastebuds to like it! kol sana wenty tayeba :)) Have a gorgeous vacation with your family. Of course it doesn't make you a bad Muslim, lol! Im not a lamb fan either. Im pretty sure between my light skin and dislike for lamb Im not allowed to call myself an Arab anymore lol! But I make up for it in my love of falafel and olives. Maybe that counts LOL!! 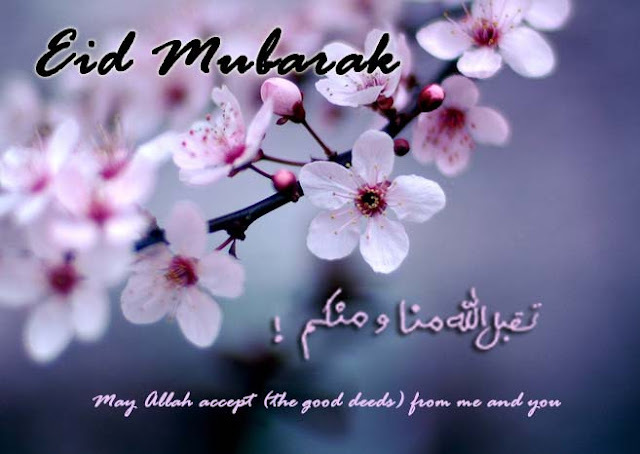 Eid Mubarak to you and the family! I Love the flowers~!!! Have a pleasant Eid with your loved ones sis! haven't been here in a while, missed reading your blog!! and i love your picture. you look so happy and glowing! Thanks everyone, the trip was great. I'll surely be posting about it soon. :) Hope you all had a nice Eid.